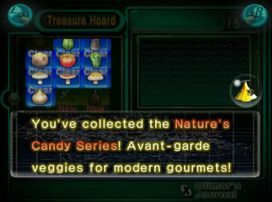 The Nature's Candy Series is a collection of treasures found in the game Pikmin 2. It is the second group featured in the Treasure Hoard and covers the treasures numbered from 8 to 16. They consist of vegetables. This page was last edited on December 21, 2018, at 12:49.